If you often find yourself skimming through the mobile app store for new apps to download, here’s a recommendation for you: try out SimCity BuildIt. 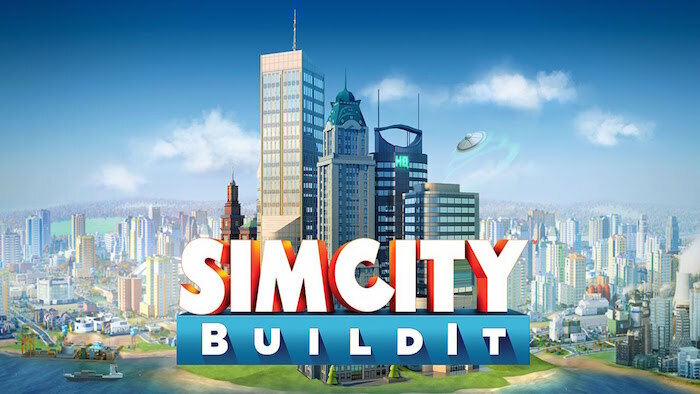 Created by the awesome guys from Electronic Arts, SimCity BuildIt allows you to build your own virtual city that has citizens “vying to move in”. The game objective is simple, and endless: the larger your city gets, the more needs your citizens have. You need to add different services such as Police Stations for security, Hospitals for health, Utilities and others to keep them happy and your city thriving. 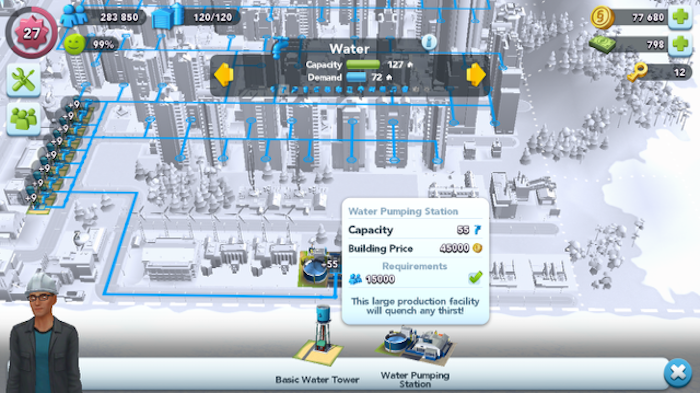 The basic building blocks for SimCity BuildIt are factories. With factories, you can make raw materials, which can then be used to build houses and make more expensive products. These are in turn sold to earn income (simoleons). 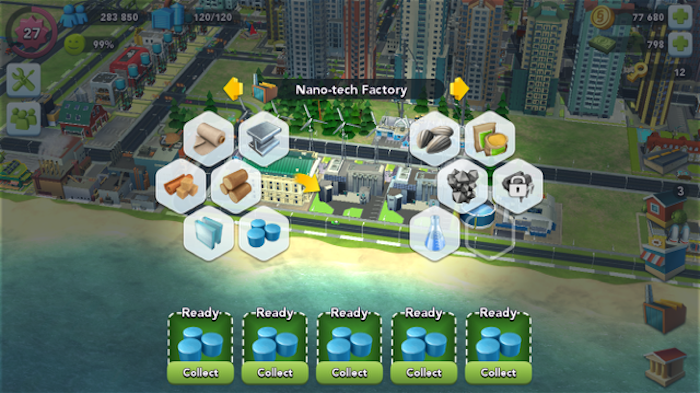 Basic factories come with two production slots; you can upgrade these slots by using in-game credits. With more production slots, you save more time in the long run, and produce more than your storage capacity can store. 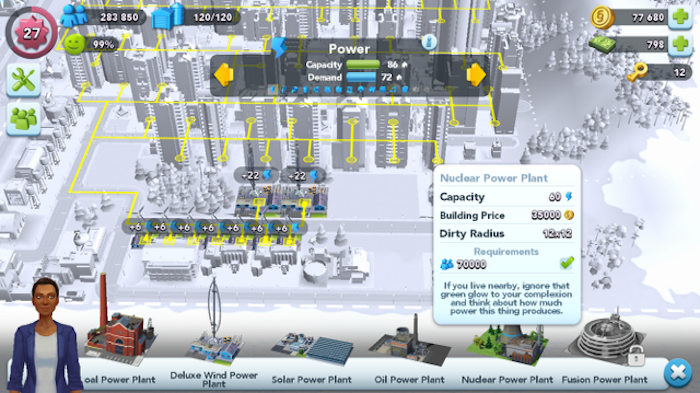 So whenever you can, you should definitely upgrade your factories’ capacity. I find that 5 production slots are perfect for me. 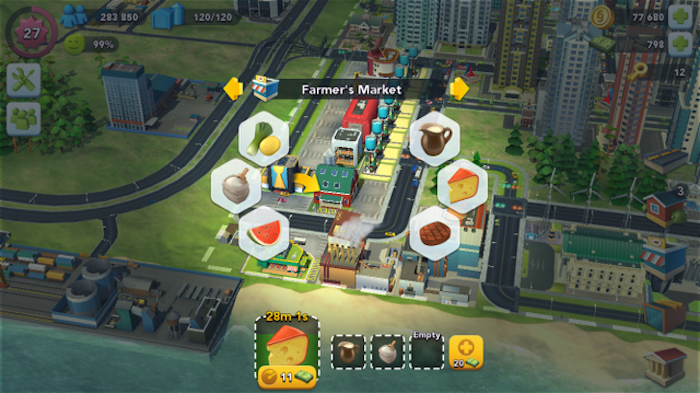 As you proceed in the game, you will be able to build more production facilities like a Farmer’s Market, a Hardware store, furniture stores, and many more. As with each building, you start off with two production slots. Whenever you can, use in game credits to purchase additional production slots for Farmer’s Markets, building supplies stores, and hardware stores. Furniture stores and gardening supplies can make do with the default two production slots. Halfway through the game, you will be given an option to unlock the Vu Tower. This allows you to cast disasters upon your city and destroy a random building. You will then be required to repair the building, and in return, Dr Vu will reward you with golden keys which let you unlock specialised buildings. Personally, I think Vu Tower is a complete waste of resources, and the cost of upgrading it is just too high. If you are someone who doesn’t play a lot, and depend on taxes for income, I recommend that you give Vu Tower a miss. You can always earn golden keys through cargo shipments, which come once every 5 hours. Golden keys are important in the game for you to unlock specialised buildings, which are used to boost your population multifold. Since I don’t particularly like using Vu Tower’s disasters, I rely on cargo shipments to get Golden keys. 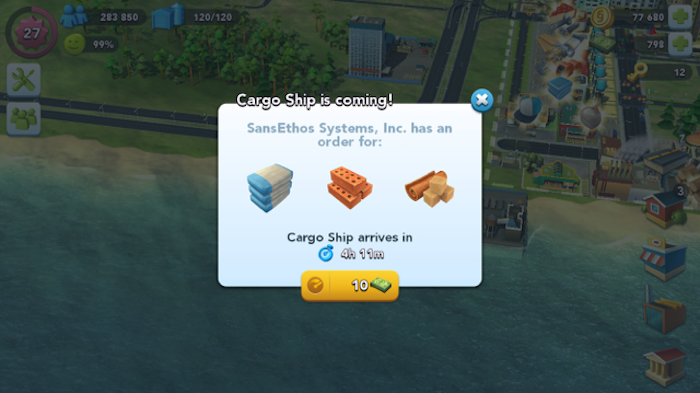 Do keep a look out for the required cargo shipment products, and make sure you have them in your storage when they arrive so you can instantly complete shipments. Once you do so, you’ll earn your Golden key and the clock resets for another shipment. You want to make sure the shipment clock resets as fast as possible. 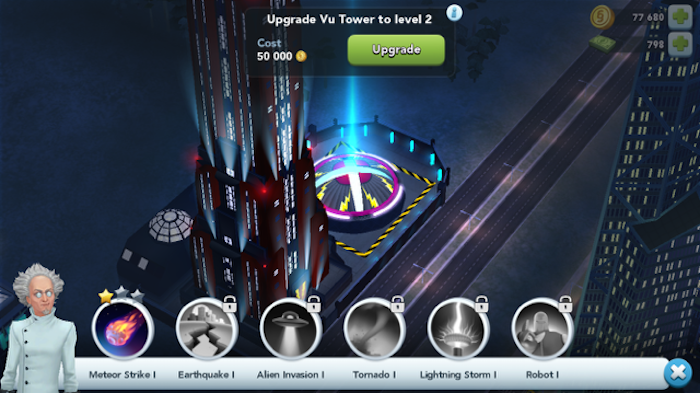 As you proceed in the game, you can decide to construct buildings for education, transportation, gambling facilities, entertainment, and et cetera. Once you’ve earned enough, you might be conflicted as to which category of buildings to unlock first. Try to unlock education buildings; they are greater population multipliers than transportation buildings. 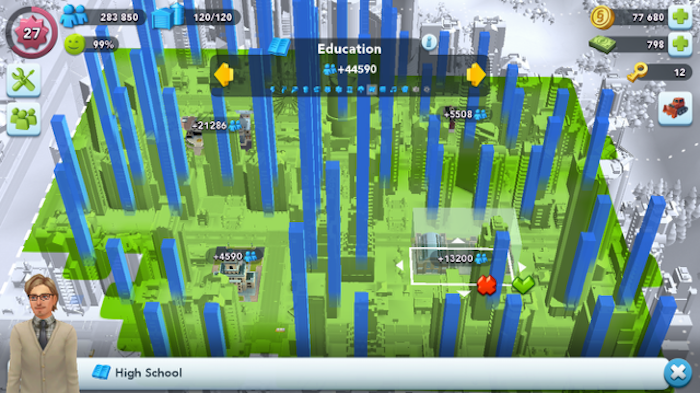 The best are entertainment buildings, but they only unlock at a later stage. If you do reach that stage, always aim for the ferris wheel, which is arguably one of the best population multipliers you can get. When you build services for your citizens, whenever you can, opt for the more expensive option. It is tempting to get the cheaper ones, but as the game proceeds and land area becomes scarce, you will find yourself hoping that you purchased the more expensive options. For example, with health services, there are three options: the small clinic, the health clinic, and the hospital. 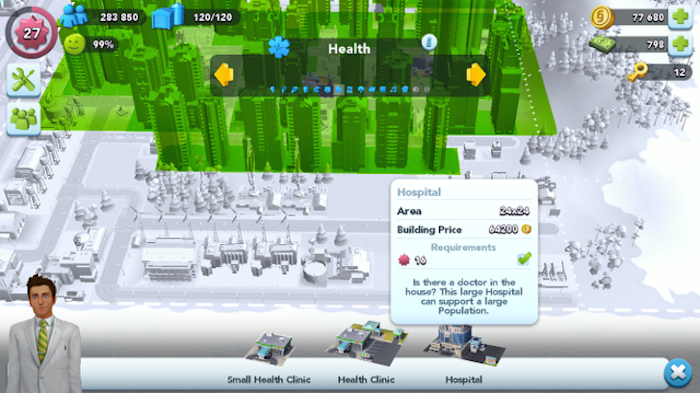 The hospital might come with a more extravagant price tag, but it will cover more services to meet the needs of your citizens. The same goes for facilities like electricity and water supplies: always try to aim for the most expensive options — they will give you the best value for money, while requiring the least land area. 7. Tax rates don’t increase in direct correlation with population size. 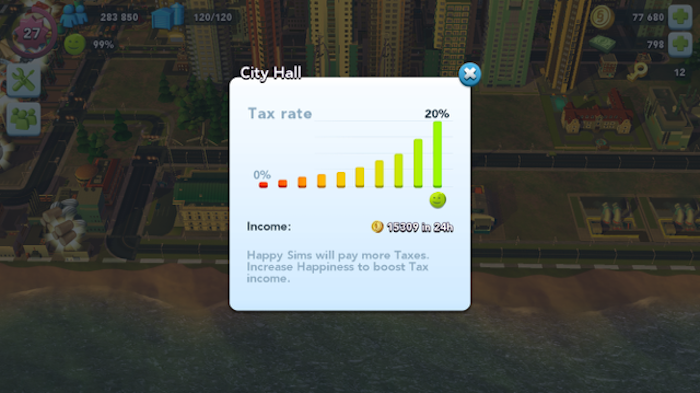 One of the biggest complaints gamers have with SimCity BuildIt is that tax rates do not increase in direct proportion with population size. Taxation is important because the more citizens you have, the more tax you collect, and the more buildings you can purchase. While we strive to get as many citizens we can, you will slowly realise that the amount of tax collected increases only a small, almost negligible amount as more citizens enter your city. So do not be obsessed with trying to build more residential buildings to get more citizens. Instead, spend more time earning income to build specialised buildings, and use resources to build the most expensive service buildings (like hospitals). Make sure you’re properly equipped with them before you proceed to the next level. One final tip: you should always keep a lookout for road congestions. I always upgrade them when they turn yellow; this makes sure they are still relatively affordable. Roads with heavy traffic jams are more expensive to upgrade, and by that stage, your citizens will abandon some buildings, thereby reducing your population. 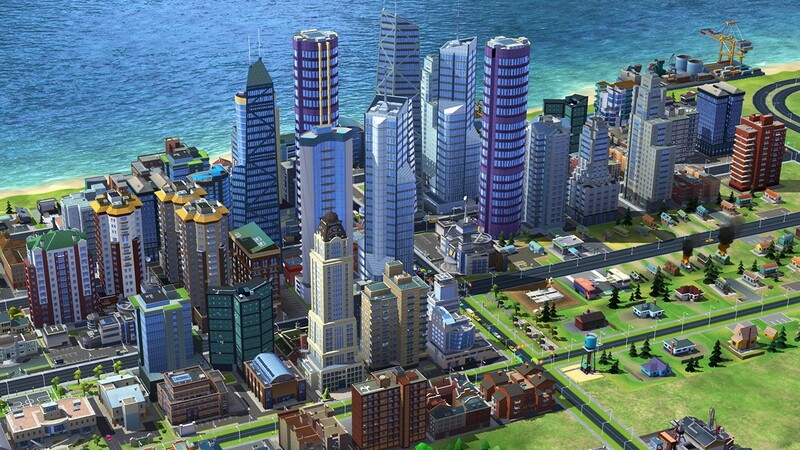 So there you have it, some tips for all of you looking at exploring SimCity BuiltIt. Don’t be in a hurry to level up, but instead, spend time making sure you have all you need before proceeding to the next level. 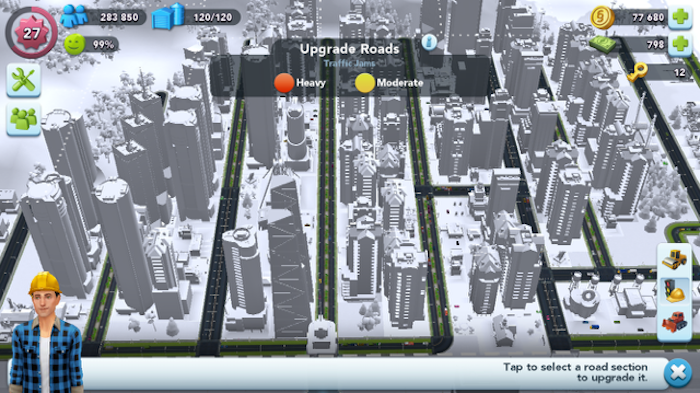 You can download Simcity Buildit for PC.